Item Description: Sleep safe and sound—in style. You’ll rest easy thanks to the top bunk’s guardrails, and they’ll love the “cool factor” of the industrial/contemporary design. 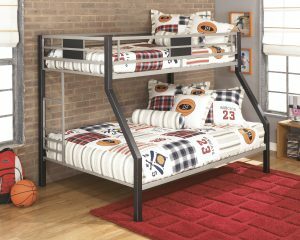 The Dinsmore bunk bed is a victory for the whole family. Item Features: Made with tubular metal in durable powdercoat finishes.